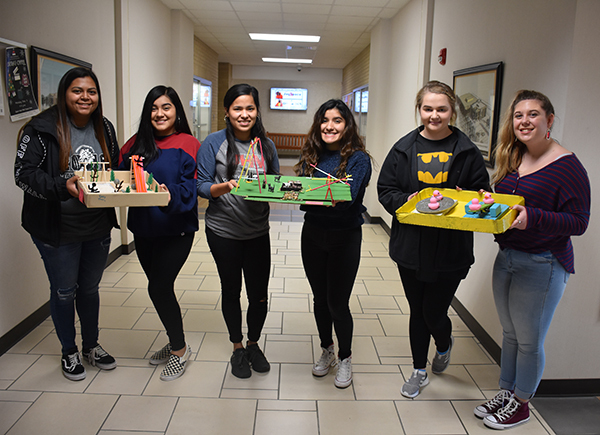 Freshman University of Houston-Victoria students Thalia Lozada, left, Emily Valtierra, Araceli Ramirez Garcia, Samantha Cortez, Hannah Konvicka and Kendall Rodriguez show their playground models Monday after their projects won a campuswide People’s Choice vote on Friday. The first-place model was made by Garcia of Victoria and Cortez of Houston, and the second-place project was by Lozada of Victoria and Valtierra of Rosenberg. Konvicka of Katy and Rodriguez of Leander received third place. The projects were part of the students’ “Freshman Seminar: Math Satellite” course and taught the students about size proportions and budgeting. In addition to building the models, the students had to put together an annotated bibliography of articles that examined the benefit of physical activity for children and write a report about the math concepts used in the models.